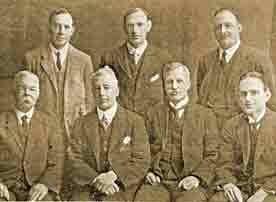 Leaders of the Inverness-shire Trade 1923. Back row (left to right):- Mr A N Nicolson, secretary and treasurer of the Trade Defence and Veto Defence Associations; J Walls and A F Petrie, vice-presidents, Trade Defence Association. Front row (left to right):- J Carson, vice-convener, Veto Defence Association; W McAllister, president, Trade Defence Association; E C Jack, convener, Veto Defence Association and Arthur Tait, ex-president. 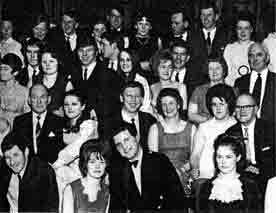 Staff and guests of the Scottish Brewers' Inverness depot pose for a photograph during the annual dinner-dance in the Muirtown Motel, Inverness. 1970.